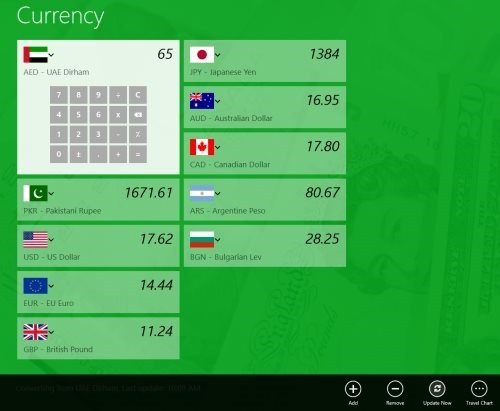 Here are 4 free Windows 8 currency converter apps that let you view the exchange rates between currencies. You can also input the value manually and check the rate. These exchange rate Windows 8 apps are very easy and simple to access. 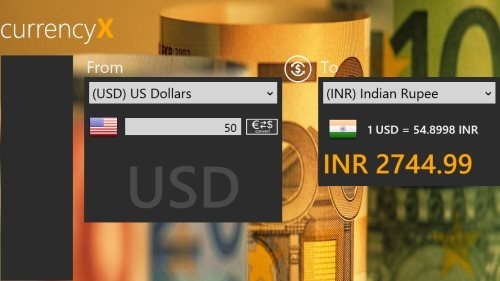 Currency is a simple currency converter app for Windows 8 where you can convert currencies between two different countries. Along with Calculator Mode, this Currency app also consists of a Travel Chart mode where you can check the exchange rates in numerical order ..till 1,000. Now, in order to see Travel Chart, you need to right-click anywhere on the screen and click on ‘Travel Chart’ ? you will instantly see the travel chart. In order to convert currencies, you need to select countries between which you want to convert currencies. Once done, now you can select the value.. the converting value shows on the top of the calculator and the converted value at the bottom. Below, the app also displays the currency’s name from which you are converting along with last updated time. Also, there are settings that you can adjust according to your preferences. For this, you need to head over to the ‘Settings’ by pressing ‘Win+C’ key combo. Then, after that just click on ‘Options’ button and get all the settings. The interesting thing is that once updated, it works offline too. Go ahead and download Currency app in Windows 8 now. 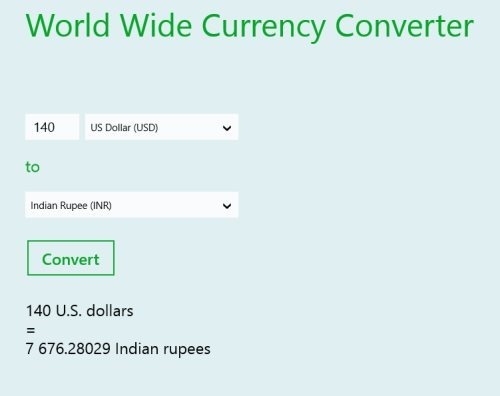 Currency X is another currency converter Windows 8 app where you can easily convert currencies between two or more different countries. This currency converter app comes with an amazing colorful background over which you will find two boxes consisting From and To currencies. You just need to select ‘From’ which you want to convert currency ‘To’ another. You can also flip and check the vice-versa exchange rates. The currencies have been described with the currency name along with the country’s flag. You will also find value of 1 currency in each conversion. It’s a good utility currency converter app for Windows 8. Go ahead and download Currency X in Windows 8 now. Also, check out our posts on Travel Guide App, and Search Engine Apps. Yet another simple currency converter app that lets you convert currencies between two or more different countries. It does what it claims.. yup, converts currencies. All you need to do is just select the currencies between which you want to make conversions. Once you are done, just click on ‘Convert’ button. You will get the results instantly. You are done.. Go ahead and download World Wide Currency Converter app in Windows 8 now. Do not miss out our posts on Stock Market Apps and Expense Tracker Apps. 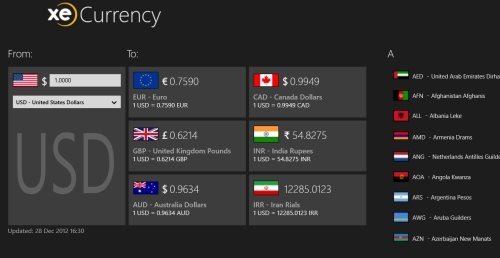 Ending my post with this last but never the least Windows 8 currency converter app, XE Currency lets you view live exchange rates. You can easily convert currencies between the two or more different countries, covering the entire world. The app updates the current exchange rates and save them. Hence, you do not need internet for converting the values. You can also and track 10 of your favorite currencies at the home page. You can also pin to start a country’s currency rate to track every time. In addition, there are other settings that you can adjust according to your preferences such as Enable / Disable display symbols, select the number of decimals you want to display, and the like. It’s a good utility currency converter app which is a must for all Windows 8 users. Go ahead and download XE Currency app in Windows 8 now.